Dermology claims that their anti-aging cream uses four active ingredients that, when combined, have the power to greatly reduce the appearance of wrinkles and other signs of aging. 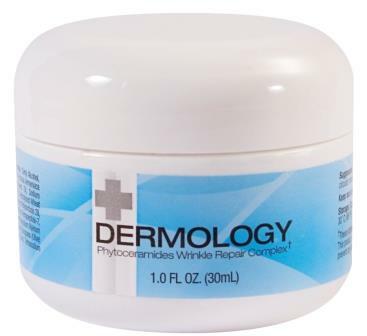 They claims that this one cream will help the customer to have the young, firm skin that everyone dreams of. We noticed some overall great things about this product. It's great that it doesn’t leave a greasy feeling (who with an oily face wants to wash their face, and make it look even greasier?) The ingredient list doesn’t look to suspicious either. The ingredients help to tighten and relax the skin, helping to reduce wrinkles. We found it interesting that this product does not include Retinol, and also that the science behind the product is simply toning the skin and moisturizing it. Only one active ingredient helps to promote collagen production, which is a vital part of reducing wrinkles. Another great thing is that this product can be used on all skin types. On the downside, the allergic reaction was a bit alarming. Even more alarming was the company attempting to downplay the symptoms of an allergic reaction by stating that any individual that uses a skin care product takes the risk of experiencing an allergic reaction. While this may be true, all natural product rarely, if ever, cause an allergic reaction. In fact, none have been reported for many all natural products. The company’s attempt at minimizing the reaction led us to question how trustworthy they really are. After a bit of digging, we did not come up with any reports of the company being a scam or refusals to refund customer’s money as other companies have. The verdict? The company may not be sympathetic if you are experiencing an allergic reaction, but they won’t try and scam you either, which is a great thing. The product contains some great active ingredients, and has been known to decrease the appearance of wrinkles, even if it takes quite a while. If you have sensitive skin, this may not be the best product for you, but I’m going to give it a go!